When Christians meet for the first time, we often share with each other how we came to personal faith in Jesus Christ. Although, most probably, we have not met in person, we are now meeting as you visit our web site. Since the most important qualifications for a pastor are that he be a man who has that saving relationship with Jesus Christ, and that he be a man who is called by God into the ministry, please let me take a few moments to share with you how God has led in my life over the years. When I was growing up as a boy, my parents thought it was important to send my sister and me to Sunday School, although they did not have much spiritual interest themselves. This background helped me form the habit of regular church attendance. During my high school years, I attended a church which was part of theologically liberal denomination, where we were told in Sunday School that the Bible was just a collection of myths and fables, and the regular message from the pulpit was, "Be good, love your neighbour, and you'll get to heaven!" Although, at the time, I didn't know why, that message just didn't ring true in my mind, nor did it satisfy my soul. I felt spiritually unfulfilled! I cannot recall ever hearing God's plan of salvation until about a year after my wife Hae Ja and I were married. We began looking for a local church to attend in the neighbourhood where we living. After trying a number of churches where Jesus Christ was not even mentioned during the entire hour, we visited a church whose sign read, "We preach Christ crucified, risen, and coming again!" There was something different about that church! For the first time in my life, I was in a church where people carried their own Bibles to church on Sunday morning, and used them to confirm what the pastor was saying. The pastor did not preach a humanistic philosophy. Instead, he preached from the Bible, and spoke with the assurance, "Thus saith the Lord." As I began to study the Bible in preparation for Sunday School class, I discovered why the message that I had heard all my life, "Be good, love your neighbour, and you'll get to heaven!" just didn't ring true. I learned through the pages of God's Word that I was a sinner and needed to be saved. You can't truly live the Christian life, until you first become a Christian, and the way to become a Christian is to confess your sin to God and appropriate the finished work of Christ, believing that Jesus died on the cross to pay for your sin, and then asking Him to save you. It was in November 1963, that I opened up my heart to Jesus and asked Him to save me. Shortly after being saved, I realized that God had saved me for a special purpose and wrestled with the Lord about preparing for full-time Christian service. In September 1965, I entered Bible College, and eventually graduated from Baptist Bible College of Pennsylvania. 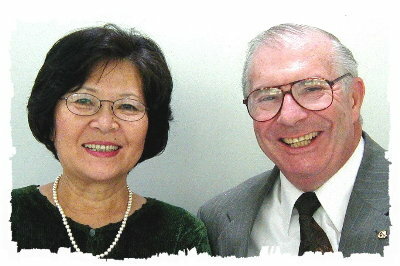 In 1972, Hae Ja and I applied to Baptist Mid-Missions, believing God was calling us to serve Him in Korea. It was our privilege to plant a new independent Baptist church in the rapidly growing Yong Dong district of Seoul. The Lord then redirected us to New Zealand, holding before us Isaiah 52:10, "...all the ends of the earth shall see the salvation of our God." During our seventeen years there, the Lord enabled us to establish the Grace Baptist Church of Hamilton, and the Independent Baptist Church of Invercargill. Prior to my assuming the pastorate at Grace Baptist Church of Citrus Springs, Hae Ja and I were engaged in a church planting ministry with Baptist Mid-Missions in Halifax, Nova Scotia. Since June 2002, it has been our privilege to minister at Grace Baptist Church of Citrus Springs. Our heart's desire and prayer is to see many of our friends and neighbours come to personal faith in the Lord Jesus Christ, and to help Christian families grow into their relationship with Him. If we can be a help to you, please call me at (352) 445-9013 or email me at gracebapch@bluebottle.com.